The ancient stadium of Olympia, which was excavated from 1956 to 1961. It is a picturesque expanse of Greek countryside, but one which harbours many secrets. It was here the ancient Greeks held their Olympics. For well over a hundred years archaeologists have probed the site where the ancient Olympiad was held. But where did the Greeks compete with their horses and chariots in the legendary hippodrome? Many assumed nothing of the hippodrome survived. The area described in old texts has been flooded by the Alfeios River since ancient times and covered with silt. Now, its precise location has been revealed by sports historian Professor Norbert Müller, of the Johannes Gutenberg University Mainz, and fellow researchers Dr Christian Wacker, who is a sports archaeologist from Cologne, and and Dr Reinhard Senff, chief excavator of the German Archaeological Institute. Aerial view of the area with the reconstructed location of the Hippodrome of Olympia. 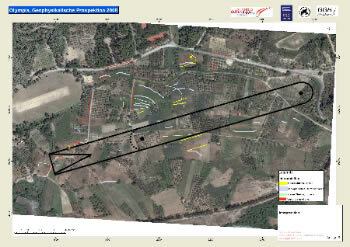 Using modern geophysical methods, they led a project in which the area was systematically searched for the first time. Geomagnetic and georadar techniques were able to map soil disturbances such as water courses, ditches, and walls. Conspicuous, rectilinear structures were indeed discovered along a stretch of almost 1200m. The researchers believe this to be the racecourse, which ran parallel to the stadium. Structural remains identified as the temple of Demeter that is known to have been sited near the hippodrome were discovered in the northern part of the area investigated in the spring of 2007. Of particular interest is that at the halfway point of the northern access to the starting-gates there is a circular arrangement with a diameter of about 10m, clearly marked in the ancient soil layer. It could well be the remains of a sacred structure described in ancient texts. The teams maps by georadar, up to a depth of eight metres. The actual starting-gates, with boxes for up to 24 teams of horses, are most probably under a gigantic pile of earth excavated by archaeologists investigating a temple area. 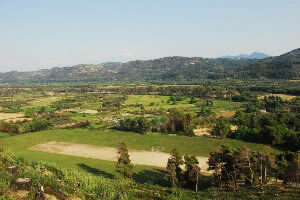 The area east of the sanctuary of Olympia had not been the subject of archaeological investigation before, although the ancient written sources show that this must have been the site of the largest construction, in area terms, built to host competitions. According to Pausanias, the hippodrome lay south of the now researched and reconstructed stadium. Researcher believe they are about 2m below the ground surface. The complex had a length of 1052 meters and a width of 64 meters, not including the earth walls built for the spectators. The starting-gates stretched the full width of the racecourse.